Today, six of our Sixth Form students competed in a ‘Healthy Eating’ WorldSkills UK Inclusive Skills competition at East Durham College. They competed with students from other colleges in the area. The task was to create two healthy meals from ingredients provided. Students also had to demonstrate that they were working safely and were preparing the food skillfully. Marks were also awarded for presentation and being able to say why they chose those ingredients. Students really benefited from the experience of visiting another Sixth Form College and meeting learners like themselves. Our students were great ambassadors for Catcote and made some new friends. We are really pleased to announce that one of our teams won the competition. 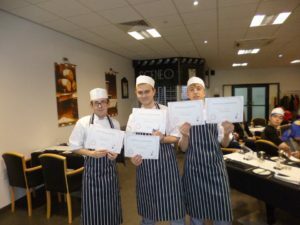 The judge was particularly impressed with the organisation and team-work demonstrated as well as the final preparation of the meals. Both of our teams did exceptionally well as you will see from the photographs.